GCA Altium acted as exclusive financial advisor to the shareholders of TMC, a leading international manufacturer of packaging machines for tissue and personal care products, on the sale of 82.50% of TMC to IMA Group, a global leader in the production of systems and machines for pharmaceuticals, cosmetics and food packaging, listed on the Milan Stock Exchange. Founded in 1997 by Matteo Gentili, Vanni Angeli and Valter Marcolini, TMC is a global player in packaging solutions, with long-established leadership in niche markets such as tissue rolls, baby diapers and feminine care products. 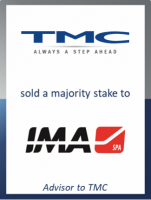 TMC and its subsidiaries expect around €80 million sales and over €10 million EBITDA in 2018 as well as strong potential for growth resulting from support from IMA as part of the integration process. At closing, IMA will pay a consideration of €58.5 million for the acquisition of 82.50% shares and will sign put & call options for the remaining 17.50%, which will eventually be exercised by April 2023. Matteo Gentili, Chairman of TMC, commented: "We are very satisfied with this deal and we are convinced that IMA, as a global leader in the packaging industry with its international reach, strong brands, experienced management and robust R&D, is the ideal partner for TMC to boost its technological and commercial growth. The GCA Altium team guided and supported us with full commitment, focus and competence, delivering the best possible outcome for TMC and its shareholders." Carlo Dawan, Managing Director at GCA Altium, added: "This deal marks another high profile transaction for us in the Industrial space. More specifically, it underlines our strong competence and significant experience in the packaging sector." Previous deals GCA Altium has completed in the packaging sector include advising ALPLA on the acquisition of Boxmore, Eurosicma's shareholders on the sale of a majority stake to IMA as well as Transworld Packaging Holding (Ilapak) on the sale in two steps of a minority/majority stake to IMA.